In our ongoing series of the A-Z of Perimeter Security, we recently looked at the letter 'N'. We explained how we had helped to provide effective perimeter systems for clients in the Netherlands and the National Trust in the UK. These were clients with outdoor sites ... which brings us conveniently to the letter 'O', our next chapter in the A-Z series. The majority of sites for which we provide perimeter security are outdoors. The exceptions to this are interiors of buildings such as warehouses and museums where our Flexiguard™ perimeter detection has proved highly effective. 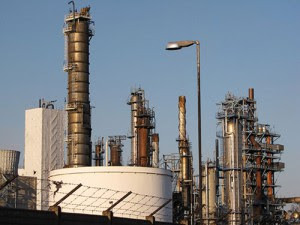 Outdoor sites such as oil refineries are amongst the most important in a country's infrastructure and only the highest quality of security system can be considered for their protection. Our systems carry full British Government approval for this type of site - generally known in the UK as EKP sites (Economic Key Points). The Chevron company in Hawaii selected our products for the protection of one of their oil refineries in Hawaii. Oil refinery sites are usually very large and in requiring a high level of protection, we usually see the perimeter fence being installed at an above standard height and often with a double line of fencing. The fences are usually one inside the other and we have three products that work superbly in combination in this scenario. The first is our Electro-Fence™ system installed on the inner fence, the second is our Flexiguard™ system on the outside fence and the third is our Microguard™ microwave sensors working in the sterile area in between the two fences. Our customers need to have confidence in the security systems that we offer and we are committed to working to the highest standards of design and manufacturing. Our company conforms to BS EN ISO9001 Quality Assurance Standards and our Quality Control policy is strict, ensuring that all components in our products are of the highest quality; any and all suppliers must also have a similar quality policy. This commitment to quality is at the heart of everything we do and is, we believe, one of the reasons why so many national and international companies choose to install our perimeter security systems.